The lineup is solidified for this year’s Mead & Metal Fest, being held Saturday, January 5th, 2019 from 6-10p at our Mead Hall in downtown Madison! 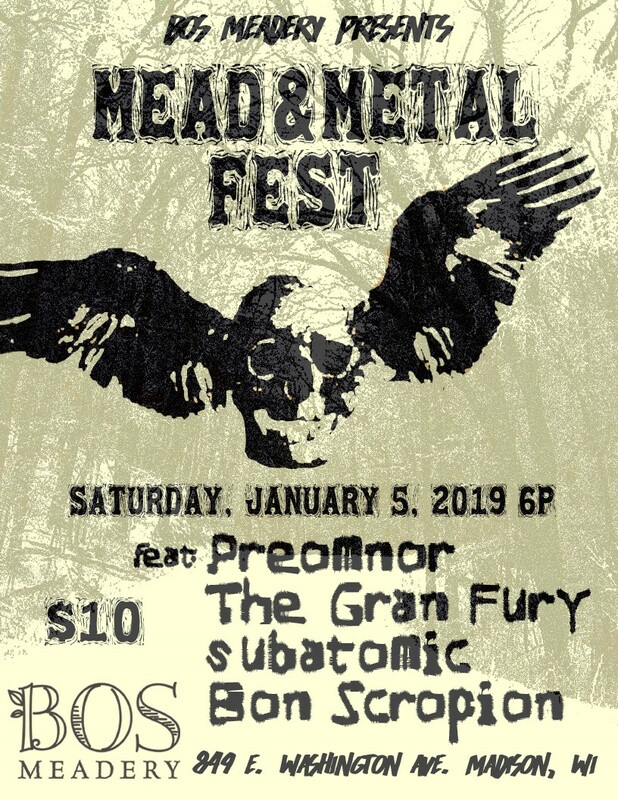 Bos Meadery is once again proud to present a berserk array of local hard rock and metal at our annual Viking-themed winter festival: Preomnor, The Gran Fury, subatomic, Bon Scropion, along with your returning emcee and yeast lord, Peter DeVault! We’ll have a slew of meads on tap, beer, soft drinks (including our non-alcoholic sweet ginger elixir), food/snacks, and the now traditional brutal poetry readings between sets! Metal and Viking costumes are appreciated and encouraged!